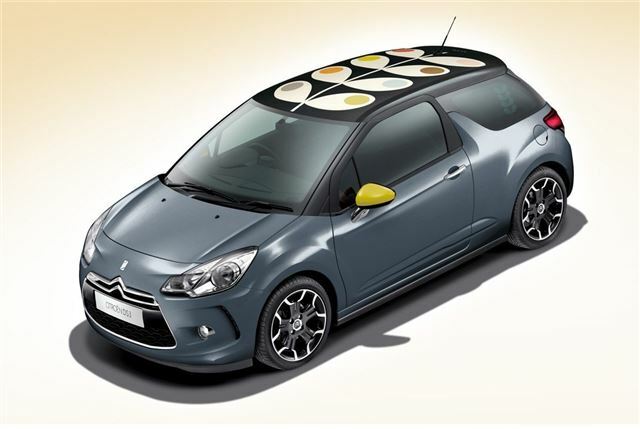 Citroen and globally renowned designer, Orla Kiely, have revealed details of an exciting collaboration for an exclusive line of DS3 models - the DS3 by Orla Kiely Collection. Limited to just 500 cars, the DS3 by Orla Kiely Collection integrates the designer's iconic style with the distinctive DS3. The collection showcases four body colours, four different roof designs - featuring Orla's signature stem or acorn patterns, coloured door mirrors, stem print rear window graphics and black or white 17-inch alloy wheels. An Orla Kiely stem graphic also features on the rear tailgate, with a further signature positioned in the middle of the rear spoiler. Inside, there are stylish leather seats with Orla Kiely embossed multi-coloured headrests, stem or acorn print carpet mats, a colour contrasting dashboard and door handle inserts in cream or brown. Orla Kiely commented: "Collaborating with Citroen and DS3 was such an exciting project as it's so different from all my previous work. I love the designs we've created and the way they're incorporated into the car"
The DS3 by Orla Kiely Collection is based on the DStyle HDi 90 manual, a generously specified model including Bluetooth and USB connectivity, which is powered by a fuel and CO2 efficient powerplant. The DS3 by Orla Kiely Collection is on sale from 1 February 2011, priced from £16,000.